Cosy Cabins in Southport on the Kwa-Zulu Natal South Coast comprises 2 traditional log cabins nestled amongst an array of tropical plants on the hillside. 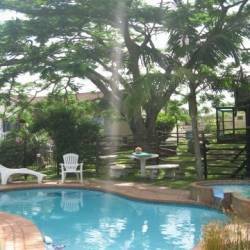 These self-catering cabins are ideally suited for small families, couples looking for a romantic break or for people working on contract in the Port Shepstone area. The cabins each have one bedroom, bathroom with shower and open plan kitchen/lounge and dining area. The smaller cabin has a double bed in the main bedroom, and a sleeper couch in the open plan lounge whereas the larger cabin provides 2 single beds in the main bedroom and 1 single with 2 bunk beds in the lounge area. Both offer amenities such as TV'S with DSTV, a fully equipped kitchen and bed linen. Wooden decks surround both cabins and braai facilities area available for both units. Why not bring your four legged friend along and take a brief walk down to Melville Beach, just 3 kilometres away or explore the many sights and activities available in the area. As there are no residents on site, for security reasons we do not advertise the address, but check in details are given on confirmation of a reservation.